The elementary strings program starts as early as 4th grade, though students can begin in 5th and 6th grade. Students who continue with strings from 4th grade onward will be placed in classes that correspond to their ability. 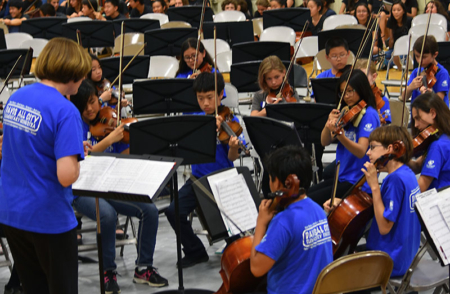 When students matriculate from the elementary strings program to the 7th grade intermediate orchestra, they will have had the appropriate pre-requisite experience. Each junior high site has a 7th grade Intermediate Orchestra and an 8th/9th grade Advanced Orchestra. Students with at least one year prior experience are eligible to join the Intermediate Orchestra. In turn, members of the Intermediate Orchestra (or equivalent experience) are eligible to join the Advanced Orchestra. Angelo Moreno directs the program at Holmes Junior High, additional information about this program is at dhs-holmes-orchestras.org/holmes.